I have a background in Computer Science, but this year was my first season as an apprentice on a farm. As soon as I arrived, I realized how little I knew about food, and where and how it's grown. Everyone around me seemed to know this stuff like the back of their hands. This project has served as a jumping-off point for understanding our food system here in the United States. This website is a simple interactive map and histogram which updates based on what agricultural product you select from a dropdown. At a glance, this allows us to not only see which areas produce a given agricultural product, but also how that particular product is distributed cross the country. In particular, the dot centers represent counties which produce a particular product (both crop- and animal-based); the dot sizes are proportional to how much of that product they produce; and the histogram bars roll up the information on a state-by-state basis to give us an idea of the scale of production for a particular product. 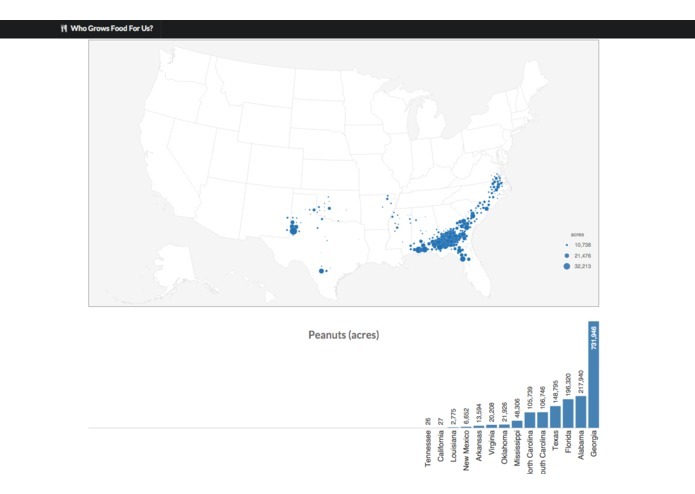 This application uses the NASS QuickStats API to get information about agricultural products at the national, state, and county levels. 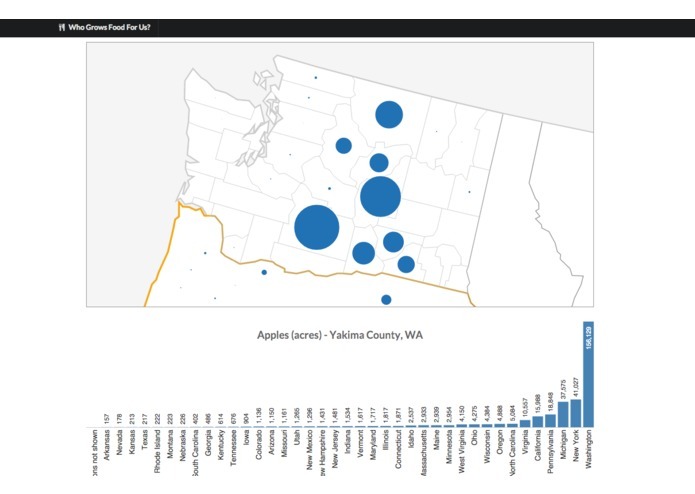 Using a series of data processing tasks, the information is filtered, transformed, and combined into a format that is used to display the map and histogram. The website runs entirely in the user's browser and does not have a back-end server. Researchers and other programmers can reproduce, manipulate, and extend the data and interface to provide additional information and contexts for our agricultural system. One of my priorities was User Experience. In that context, I found that the NASS Quick Stats API was too slow to provide the responsive interface that I wanted to give people. Additionally, the size and scope of the datasets provided by the API meant that there was a lot of information available for users which could create a confusing user experience. To solve both of these problems, I created a series of data processing tasks which download, clean, and transform the NASS Quick Stats results. 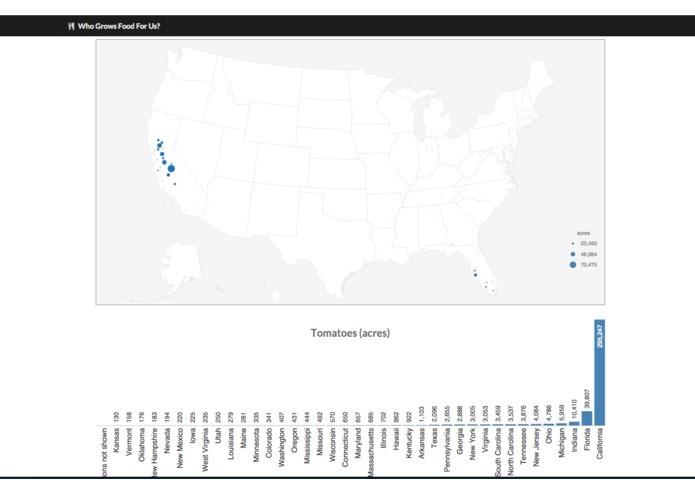 The resulting JSON files can be used by other researchers and programmers to create additional visualizations and reports with a better user experience and less learning curve. See the README for more information on how to do this. I am proud that this project can provide an open-source foundation for consumers and researchers to start digging into the USDA data. One of the major accomplishments of this project is related to the data filtering, transforming, and simplifying that lies behind the interface on the screen. The code is open source and has hundreds of accompanying test suites to document how and why transformations happen. I believe that this aspect in and of itself can make future projects relating to the USDA NASS QuickStats information to be more accessible to future researchers and developers. Data analysis and making maps are harder than they might seem at first glance! I was fortunate to have Allan Stuart of Allan Cartography (Medford, OR) as an advisor/mentor as I navigated this project. My original concepts were trying to communicate too many things at one time which meant they did not communicate anything well at all. 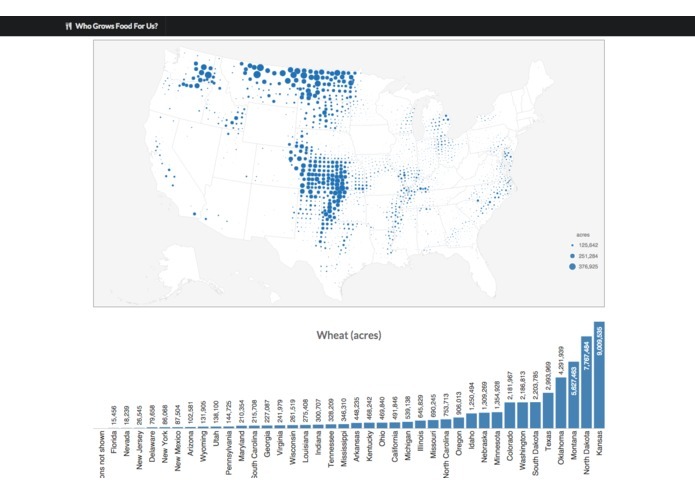 In the end, the simplest, meaningful information that I could convey had to do with mapping and graphing the distribution of agricultural production across the United States. I am continuously discovering new patterns and insights by looking at this map as I learn more about how, where, and who produces food here in the United States. There is so much more to explore! The USDA has datasets on the socioeconomics of communities; NOAA has information on weather; and the USGS has datasets on soil. There are many ways in which WhoGrowsFoodFor.Us can act as a platform to learn more about the places and people who grow food here in the United States.